What do you get when you merge two hand-held devices into one? A slew of compromises. 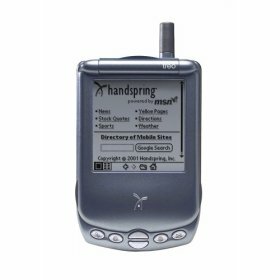 That’s what designers at Handspring learned when creating the Treo smartphone, a combo cell phone and PDA, with email, web and messaging functions. After all, it’s not easy to squeeze two microprocessors, a radio, and an antenna into one hand-held device. Something has to give. A company known for its Visor hand-held computer, Handspring veered into the wireless phone market last fall when it unveiled the Treo 180, the first in a series of three related products. Treo is designed for people on the go, replacing their cell phone, pager, and hand-held computer with an all-in-one solution. Smartphones are not new. They began popping up several years ago, but earlier versions like the Nokia 9000i Communicator or the Qualcomm pdQ were too clunky to compete with pocket-sized cell phones. In contrast, the Treo is more refined, compact, and usable. With a flip-phone-like design, it uses a protective screen as the phone’s earpiece. On the PDA side, the Treo features a tiny keyboard suitable for thumb typing, the Palm OS, a 33 MHz Motorola Dragonball VZ processor, and 16 Mbytes of RAM. On the phone side, it operates on the worldwide GSM (global system for mobile communication) network. The Treo 270 comes with a CSTN (color super-twist nematic) display. And the Treo 300, introduced in late summer, is Handspring’s first CDMA (code division multiple access) phone, designed to work with the Sprint PCS Vision network for faster data rates. Both GSM and CDMA offer always-on connectivity, meaning you never have to dial up for data. Handspring designers tackled most of their design hurdles in the Treo 180, which laid the groundwork for the 270 and 300. The trick to designing a smartphone is striking a balance between size, weight, input ease, display clarity, memory, and battery life. It’s the sort of trade-off list that keeps design engineers up at night.